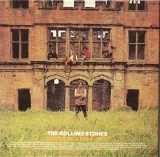 A great 2 disc compilation full of many of the Stones biggest hits. Includes: "Time is On My Side," "Heart of Stone," "Play With Fire," "(I Can't Get No) Satisfaction," "As Tears Go By," "Get Off of My Cloud," "Mother's Little Helper," "19th Nervous Breakdown," "Paint It, Black," "Under My Thumb," "Ruby Tuesday," "Let's Spend the Night Together," "Jumpin' Jack Flash," "Street Fighting Man," "Sympathy for the Devil," "Honky Tonk Women," "Gimme Shelter," "Midnight Rambler" (Live), "You Can't Always Get What You Want," "Brown Sugar," and "Wild Horses." This mini lp was included in the Limited Edition Let It Bleed Box which was issued by Disk Union on 2006-03-16 containing six mini lp titles and came with five promo obis. 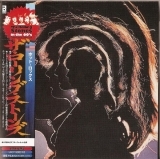 Obi:"The Rolling Stones in the 60s"
2009-11-05 - Reprint (2007-09-12) recorded by robot harry (source CDJapan).